Is necklacing returning to South Africa? Earlier this year, South African townships were rocked by incidents of necklacing - mob-justice punishment in which tyres are forced over victims' shoulders and set alight. Is this notorious form of killing from the 1980s in danger of making a comeback? Angelina Maholwana, 74, felt that justice was being done as she watched two young men burn to death. Tyres had been forced over their shoulders, doused in petrol and set alight. She had just identified Mabhutana Siwisa, 19, and Mloza Gqomfa, 20, as the men who had broken into her home, killed her son, tried to sexually assault her and stolen their belongings. It was the fourth incident of necklacing in one month, in New Brighton township, in the industrial city of Port Elizabeth. The practice dates back to the 1980s, when it became the punishment of choice among supporters of the African National Congress (ANC) for alleged collaborators with the apartheid regime - though the ANC leadership said it did not condone it. It was also used against common criminals. But necklacing appeared to die away in 1987. There had only been one recorded case in more than a decade - until June this year. The Port Elizabeth incidents - and a number of others elsewhere in the Eastern Cape Province in June and July - have raised fears that necklacing is returning as the most extreme form of a rising tide of vigilante justice. Last year's police statistics show that of the 46 killings committed on an average day in South Africa, 5% are a result of vigilantism. Beating and stoning are two of the most common ways the killings are carried out. Many people in poor communities like New Brighton township have lost faith in the police and see vigilantism as the best way of keeping the streets safe. "Mob justice is not right but it has its place in our society," says Scelo Lucas, 28. "It does reduce crime. We have seen a decrease in the crime here. People are scared because they know the community will rise up against them." Some do worry, however, about the risk of the innocent being punished for crimes they did not commit. "Mob justice is wrong because sometimes the wrong people get punished," says 19-year-old Siyasamkela Solani. "In the heat of the moment, there is a lot of room for mistaken identity." The government has warned that those who take part in lynchings may be tried for murder and the police have embarked on a campaign to persuade communities to give it up. Since July, Police Minister Nathi Mthethwa has visited the Eastern Cape twice. There are also plans to take the campaign to other parts of the country, amid fears that necklacing could spread to other provinces. In practice, however, communities tend to close ranks and protect each other when police investigate, so prosecutions are rare. 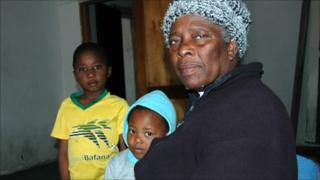 Ms Maholwana told the BBC that, in her view, the two men who killed her son got what they deserved. "They killed my David like they were killing an animal," she says. "They broke into our home and tied me and my son up and then put us in separate rooms. My feet were tied together so tight that they got swollen," she says. In an ordeal that lasted some four hours, her son was stabbed in the neck and strangled with a power cord. After the robbers had left, she found him lying lifeless in a pool of blood. The next day, the alleged perpetrators - thought to have been behind a string of house robberies - were brought by a crowd to her house. One was wearing her son's clothes. After she had identified them, the mob beat them with sticks, pelted them with stones, forced on the tyres and set fire to them. The more they tried to escape the angrier and more violent the crowd became, Ms Maholwana says. "I know that killing these boys won't bring back my son but I sleep better now, knowing those boys will never hurt anyone else again." Is mob justice the answer or the problem?